It is my pleasure to share an interview with Mr. Mark Gorman, Process Manager for the Moss Mine of Northern Vertex (TSXV:NEE). Mr. Gorman’s appointment was announced on November 16, 2017 alongside Mr. Kesler Morris as Crushing Superintendent. Read on for an extensive introductory conversation about all aspects of the Merrill-Crowe facility and how it fits in at the Moss Mine. Peter Bell:	Hello Mark, I've recently spent some time figuring out how heap leach works with carbon in columns, but the Merrill-Crowe is a bit different. Mark Gorman:	The leach is the same process up to where the pregnant solution comes out. Merrill-Crowe is generally only economic if your intention is to recover silver. The first step we would do in a Merrill-Crowe is to filter the solution. We have two large clarifying filters in the plant that are the blue filters outdoors at the plant. The purpose of those is to remove the suspended solids from the solution. The tanks basically have many filtered leaves inside them that are coated with diatomaceous earth. The dirty water is pumped into this tank and then the pressure forces the solution through the diatomaceous earth coating on the filter plates so that the suspended solids are filtered out. Clean water permeates through the plates, which then goes out of the filter. All the filter plates are manifolded together and there is center shaft where the clean water exits the tanks. The filter tank is under pressure, which pushes the clean water to the top of our deaeration tower. The deaeration tower is the large vertical tank you see at the plant. It is known as a packed bed tower. The solution goes into the top of the deaeration tower and is sprayed out over the top of the packing. The packing material is designed to have a high surface area per unit of volume, so the solution makes a thin film on the material. Then, there's a vacuum pump that pumps air out so the tower so that there is very low atmospheric pressure or negative pressure in the tank. Then, the dissolved oxygen boils out of the solution. At the elevation of the Moss Mine, water typically has a dissolved oxygen content of about seven PPM. It will reach a different equilibrium under reduced pressure as the oxygen leaves the solution. The water coming out of the bottom of the de-aeration tower normally has around 0.5 PPM oxygen, which is around a fraction of what went into it. As the solution comes out of de-aeration tower, it's still under negative pressure relative to the atmosphere but it flows by gravity through a pipe to the next stage. And that’s why the deaeration tower is up so high on the platform outside the plant – you're using gravity. The next pump in the plant actually has to be fed under positive pressure, but the whole system is under negative pressure, so you raise the tower up and use gravity to move things along. Peter Bell:	What a clever little fix. I can just imagine when they first came up with that idea. Mark Gorman:	Don’t forget – that was over 100 years ago. Next, we have a cone that looks like a toilet bowl. It’s a zinc feeder that introduces merrillite zinc, which is a very fine zinc dust, into the solution. This toilet bowl is constantly flushing water and zinc in a slurry into the suction of the pump. Once that hits the pregnant solution, the zinc precipitates the gold and silver. The zinc oxidizes to zinc hydroxide and, at the same time, reduces the gold and silver to metallic gold and silver. Peter Bell:	Interesting to hear that the zinc oxidizes after you've taken all the oxygen out in the de-aeration tower. Mark Gorman:	Not all the oxygen – there’s still 0.5 PPM. I can go through the half-reactions if you’d like to see them, but we can keep it at a relatively high-level for now. The gold and the silver are doing the oxidizing and the zinc is the reducing agent. I'd have to check if the oxygen is really required for that, but that is how it works. Once you get to the discharge from combining the zinc slurry with pregnant solution, then it is back under positive pressure. We feed it through a filter press and the gold and the silver are filtered out. They gold and silver are precipitated in the pipe after combining with the zinc slurry. At that point the gold and silver are finely suspended solids. Then, they go in the precipitation press and are filtered out. We have two large precipitation presses in the refinery building and the solution that comes out of those presses is a barren solution that is recycled back to the barren tank. We add cyanide back to it and pump it back onto the heap. Peter Bell:	Wow. Is there cyanide in the barren solution when it comes out of the precipitation press, or is it being consumed somewhere along the process? Mark Gorman:	The heap consumes cyanide, but there has to be a certain minimum amount of cyanide for the Merrill-Crowe process to work. Peter Bell:	Okay, thanks. My understanding was that the pregnant solution has some cyanide in it still, but not a lot. Mark Gorman:	We won't know until we run it. With the Phase 1 mining, the pilot heap showed that there was quite a bit of cyanide coming out of the bottom of the heap. If that happens again, then we will be fine. If not, then it is possible to add cyanide right alongside the zinc after the deaeration. It would be ideal to run the precipitation press for about one week, then take the precip press offline, blow the water out of it, dry precipitation in an oven, mix it with flux to, and put it in the smelting furnace. The flux combines silica sand, borax, soda ash, and niter that is a standard part of the metallurgical process. The furnace heats the precip and flux to around 2,000 degrees Fahrenheit and melts everything. The trash metals, like residual zinc, are oxidized by the oxidants, like soda ash and niter, and are dissolved into the glass phase. For example, it could be a borosilicate glass with trash metals in it. Peter Bell:	Right. And the original “PYREX” kitchenware was actually borosilicate glass. And all this is similar to what is done when assaying rock samples for exploration geology? Mark Gorman:	Yes, this is the same as fire assays. This part of the process is just a big fire assay, except that we don't add lead to dissolve the gold here because the precipitation should be around 30% dore with gold and silver. We'll have to wait and see about that. It may not be that high at the beginning, but we will get it up there. Peter Bell:	And then pour your gold. Mark Gorman:	Right. Pour the slag off and hopefully it’s just precious metals left going into bars. Peter Bell:	Where can things go wrong along the process? I guess there are things that can go wrong at every stage. Mark Gorman:	Once it's all up and running, it's really just pumping. I'm sure they'll be hiccups and problems along the way, but once we get everything running steadily it’s really just about keeping it going. Peter Bell:	Do you need really homogenous input for the solution? Mark Gorman:	The solution won't change very quickly. The nature of the process is such that things change very slowly. The solution won't just stop – it would probably take weeks to get the solution to stop because of the way the cyanide seeps through the heap leach. Even if you stopped irrigating, the grade wouldn’t change quickly. It all changes very slowly, which helps. We will have someone there watching, checking the grade of the pregnant solution and the grade of the barren solution. It’s important to check the water that comes out of the filter process, which is the barren solution. You want to make sure that there is no gold slipping through the precipitation process. As long as you're recovering the gold and there's very little gold in the barren, we can keep going. Peter Bell:	And you can check the Pregnant Solution as well? Mark Gorman:	Yes, but there's nothing you can do about the Pregnant Solution. It is what it is. You can check the cyanide – if there is no free cyanide in the pregnant solution, then you'd know you probably have to add some cyanide alongside the zinc. The barren solution is really where you could detect if something isn’t working correctly, whether it's something with the equipment or an air leak or the levels of zinc – that’s very important and we will have someone doing that. Peter Bell:	Great, thanks Mark. An introduction to Merrill-Crowe! Now, a question about something you said at the start – that this process is only economic if your concerned with recovering the silver. Mark Gorman:	You don't see this process being used to recover gold. If we were just after the gold, then we could have used carbon in columns. 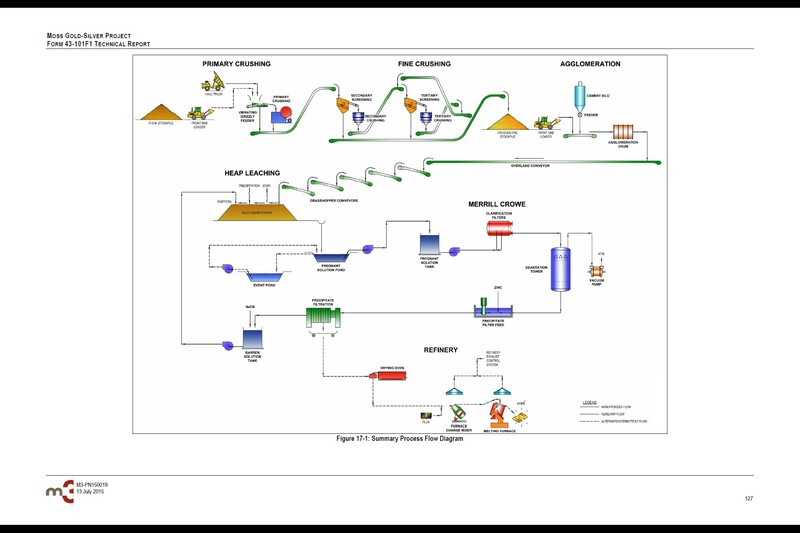 Most heap leach for gold just use carbon in column and an ADR plant, which is a strip circuit. The main costs of the strip circuit are the caustic and cyanide that you add to the solution, and fuel to heat a boiler. In an ADR, the ponds use gravity to move solution through the carbon columns and then the carbon is recycled. The cost of gold production in CIC is inexpensive, but you have to use a lot more carbon to recover silver in that process and that is much more expensive. Peter Bell:	If it is one gram per tonne gold, pure just gold and some mine material and I think there's been 20 grams per tonne silver numbers that I have kicking around. Mark Gorman:	The 43-101 has grades and they are approximately like 10:1 for silver to gold, 0.76 gram per tonne gold and 9.3 gram per tonne silver overall. It is 0.97 gram per tonne gold and 10.4 gram per tonne silver for the measured category. Peter Bell:	And how do those grades compare to the price ratios? Silver is trading at $16.10 an ounce, which translates to approximately $3 per tonne for the recoverable value the silver. I calculate that as follows: $0.50 per gram of silver, times 10 grams per tonne gives $5/tonne from silver in situ, and 60% recovery gives $3 per tonne. With gold at approximately $50 per ounce, 1 gram per tonne in situ, and over 80%, the revenue from gold is approximately $40/tonne. Clearly, most of the revenue is coming from the gold. How about these recovery rates for silver, are they typical for Merrill-Crowe? Mark Gorman:	As in the feasibility study, the recoveries are 82% for gold, 65% for silver. That’s a fairly high rate of extraction for silver from a heap leach. Most people don't run heap leaches to recover silver, so it's not typical. The thing that's in favor of this process is that they ran a test heap in 2013. You can pick at the numbers and "I don't believe this or that," but most operations don't do 115,000 tonne test heap. That's a lot of material – a very good test. When you have recovery results on such large amounts of material like that, it's hard to get surprises. If you screw it up, you'd have to have something intrinsic, like bias in the head grade or the recovery rates. But the recoveries from that Phase 1 were based off pored gold – they actually measured the gold production rather than just taking dore, which contains gold and silver. The 43-101 report compares assays versus poured gold and it matched really closely. Their production was pretty much what they estimated it should be, which provides a high degree of confidence that they made that much gold. Peter Bell:	And the geology is favorable, too. The vein is all oxidized – there's no transitional or sulphide domains within the vein. Mark Gorman:	It doesn't look like anything that's refractory or nasty. It may sound unusual, but it is also a very fine crush. There has been a lot of effort go into optimizing the production here and it will be interesting to see what happens. Peter Bell:	And if you’re concerned about the future, then you can look more closely at the past. Did they run Merrill-Crowe on that Phase 1 pilot? Mark Gorman:	No, they did carbon recovery or CIC. Peter Bell:	Okay, thanks. That helps clarify a couple things for me. For one, the recoveries used in the 43-101 reports are based on the lab testing, rather than the actual recoveries from Phase 1. You mentioned that they compared them for gold and they were similar. And the other thing is that the silver recoveries would have been fairly low with CIC because the gold is absorbed preferentially, as you were saying before. Mark Gorman:	Right. Most groups don't do test heaps, they just run column tests in the lab. It’s hard to pick at something that everyone does, but we are doing things a little bit differently here. Peter Bell:	And the recovery curves were an important data point to come out of all that pilot work, as I understand it. Mark Gorman:	Yes, they created an extraction vs. time curve that used some of the real heap numbers where possible. Peter Bell:	Right – there are strict rules around what kind of data can be used in what ways with all this stuff from the Canadian government with the 43-101 rules. I wonder about the usefulness of all the information that came out of Phase 1, given that it was carbon in columns and not Merrill-Crowe? Mark Gorman:	We discussed how gold is the biggest part of the revenue and the gold recoveries are similar. The silver recoveries should be better from the Merrill-Crowe than the CIC and I’d expect the silver recoveries to be in line with the feasibility study. Peter Bell:	There are a few parts to the story here with all the work that’s been done. Thanks for helping clarify things. Again, to ask: are there generally any significant differences in gold recoveries between the carbon and the Merrill-Crowe? Mark Gorman:	No. The gold grades of barren solution coming out of CIC are typically three times as much as a Merrill-Crowe plant. The Merrill-Crowe is almost perfect recovery. The Merrill-Crowe is at least as good as the CIC for gold and much better for silver in terms of recovery of precious metals from pregnant solution. We'll see how it runs, but there's no question that Merrill-Crowe works. Merrill-Crowe was being used long before CIC – it's an old process and people understand how it works. Peter Bell:	Amazing that they were able to figure out the deaeration and the negative pressure all that time ago. I believe it was first pioneered in the early 1900s. Mark Gorman:	Carbon is a relative newcomer. I think it was started in the 1970s as part of research into gold recovery by the US Bureau of Mines. The strip process is called a Zadra process now and it was named after a man named Zadra. I think he worked for the US Bureau of Mines and developed the strip. It's not brand new, but it's a relatively recent technique – probably about as old as me. Merrill-Crowe is quite a bit older. Peter Bell:	What kind of a team works in a Merrill-Crowe plant? Mark Gorman:	We plan to have one operator at the plant around-the-clock. There will be a refiner, which may only require one person full-time. There will be one person around-the-clock to operate the leach process – watch the ponds and the pad at all times. There will be an additional 3 people to work the pad and the piping. Peter Bell:	The piping on the pad is very important to make sure the pregnant solution flows properly. I’ve seen some pictures of crushed pipes in a presentation someone gave at PDAC and it was a little shocking. Mark Gorman:	Things should work smoothly for us, but you have to figure out if there's a problem and address it quickly. I'm sure there will be problems, but we will look after them quickly. If something's not working, then we will make whatever changes we can to make it work. Peter Bell:	Is the Merrill-Crowe sensitive to any changes in the ore that's going out to the heap, or is it pretty robust? Mark Gorman:	It's not very sensitive to the ore from this deposit, per se. The bigger determinant for how the ore behaves is how it's crushed. That affects how many days it takes to leach and things like that. That is primarily an issue for the leaching part of the business, rather than the recovery side. Peter Bell:	And what's the plan for drip on the heap? Mark Gorman:	We're going to start use drip irrigation. It should be simple. Peter Bell:	I wonder if you have much input on the heap – the layout of it and everything. Mark Gorman:	To start with, we're going to stack on the corner by the pregnant solution pond. Then, we will have a plan for how you move the chess pieces around – you want to move the stacking equipment in a way that gets the ore on the pad with the minimum amount of cost. All of that will be an ongoing activity where you deal with things as they come up. Peter Bell:	Sounds like the domain of the Mine Manager, Bill Martinich. Mark Gorman:	There will be frequent planning meetings to come up with strategy for what to do next. Keep in mind, Peter, this is not the first place in the world where this type of mining has been done. We haven't done this type of recovery yet, but it I'm sure we'll figure it out. Peter Bell:	And that’s because the Merrill-Crowe plant is industry-standard, even if it’s not typical for gold-focused heap leach projects. Do you know of anywhere else where the Merrill-Crowe is used for gold-silver projects like this? Mark Gorman:	There's one in operation in Mojave, California, right outside Los Angeles. It is the Soledad Mountain project operated by Golden Queen. They're basically operating the same kind of heap leach as us. They do agglomeration and stacking. They use a Merrill-Crowe and it's working for them. Peter Bell:	Their website has a great picture of the mine and I like the layout of it, as well. Nice and tight, compact. Mark Gorman:	Their processing area is relatively flat compared with ours. Peter Bell:	The proximity of everything is similar to the Moss Mine, though. That was one of the things about this site that always jumps out at me – everything is close and the layout of things makes sense too. There is not a lot of driving around in weird directions required. Mark Gorman:	Golden Queen have their mine in the mountain, then a crushing plant at the base of the mountain, overland conveyors, and stacking conveyors that are stacking on the heap. Down at lower elevations of the heap, they have their pond and the Merrill-Crowe recovery plant. Peter Bell:	Sounds familiar! Just like the Moss Mine in several ways. Peter Bell:	How long as the Golden Queen been in operation, ballpark? Mark Gorman:	I think they've been in operation for over a year. Peter Bell:	Okay. That's another good comparison to you. Now, I gather that you’ve done all this before yourself, Mark? Mark Gorman:	Yes, I worked for a company that designs these plants. M3 designed the plant for Northern Vertex and I worked for another engineering company in Reno. FLSmidth has an in-house design company called Summit Valley who designs them, too. There are a few places that design these Merrill-Crowe facilities. Peter Bell:	Great to hear about your Reno, Nevada connection. There seems to be a really strong mining community in Nevada and Arizona here. Mark Gorman:	As long as the gold price stays strong, the mining industry has a chance. When gold starts to get down below $1,100, then things become uncertain. A lot of these places don't make money at $1,000 gold. The autoclaves have very expensive unit prices to process the ore. The costs of many heap leaches are even around $1,000 per ounce now. If the gold price fell below that level, then you could start to see heap leaches operations closing. It would be good to see the gold price higher, but you know you have no control over that. Peter Bell:	How about the cost estimates for the Moss Mine – do you have a sense of ballpark numbers for that around the Merrill-Crowe? Mark Gorman:	No, not exactly. The thing you have to consider, Peter, is that the definition of op-ex isn't clear-cut. Most mining companies don't report the production costs including capital, but there is a sustaining capital cost that goes with mining. The Moss Mine will have costs to pay back the loan and you don't generally include that when you look at costs per tonne. After those are loans are repaid, there is still a cost of sustaining capital that's usually not reported with an op-ex. The all-in-sustaining costs is really the key figure, but there's still some judgment about what gets included and where. Peter Bell:	Yes. It may be industry standard, but it’s non-GAPP. Mark Gorman:	That's why you need to see all the costs to clearly see who makes money at $1,000 bucks and who doesn't. Peter Bell:	Are there any front-end loaded costs for Merrill-Crowe other than the capital? Mark Gorman:	No, I can't think of any. Once it's running, it should just be power, labor, and consumables. Peter Bell:	And it’s pretty quick, once the pregnant solution is there right? Mark Gorman:	Yes, it doesn't have an inventory of gold as with carbon in columns. With CIC, every one of those columns has an inventory of gold associated with the carbon. The inventory for the Merrill-Crowe is simply whatever is in the precipitation press. That's it! Once you dump the filter press, the process inventory is basically zero. There may be some in the solution in the pond or the solution in the tanks, but the gold is ready to be refined. Peter Bell:	And does the pond have some maximum capacity to it? Mark Gorman:	The operating level is less than a million gallons and would be kept at a steady level. Once you've created that inventory, it stays there until you close. The only time you'll be able to draw that inventory down would be when you're at the end of mine life. Peter Bell:	It’s interesting to hear how things are so much about the flows here. Once you get production rolling, it is about keeping at those steady levels. Now, there is a timeline for percolations of cyanide through heap and drainage into the pond, but it is pretty quick once it goes into the Merrill-Crowe. Is it a matter of hours to get gold out of the solution? Mark Gorman:	No, it's minutes. The inventory is in the heap and the pond. The filter accumulates gold for approximately a week before it is dumped and zeroed. At the end of the month, you can zero out most of your process inventory. It makes it pretty easy to calculate production numbers and can avoid fluctuations in gold in process inventory. Peter Bell:	Always important to have some control over the final product. Mark Gorman:	Right. And the dore is shipped out the doors of the Merrill-Crowe facility! Peter Bell:	Alright, thank you very much for the conversation Mark. Thanks for indulging my interests in all aspects of the process. Mark Gorman:	You’re welcome, Peter.